With the busy timing of holiday parties and gift giving, you might find yourself in need of something sweet and small to offer to new additions on your list! I find a sense of peace knowing that I have a few extra presents around for the surprises that pop up. Here, to the rescue is a quick jar present that you can make ahead and gift to your heart's content or, if not needed, scavenge for yourself. First off, if you've never made homemade marshmallows, may I encourage you to grab some unflavored gelatin and get on it! We made our first batch this year, and I am hooked!! Seriously. So much easier than I ever imagined. And waaaaaay tastier. You can catch our whole marshmallow creation over on the Honest to Nod blog! I'm a monthly contributor to The Land of Nod's fun site, and we shared our experience with fresh marshmallow here. Download the free printable recipe for fresh marshmallow and pair it with a jar of cocoa mix for an almost-homemade gift for anyone on your list! For these jars, we used small cubes of fresh marshmallow on top of our cocoa mix. You can create your own combination or go semi-homemade like we did (half Kirkland's cocoa mix and half Ovaltine) and gifted our favorite combination of Christmas cocoas. I topped the cocoa with a piece of parchment paper to keep the mix and marshmallows from mixing. Top off your holiday gifts with these cute stickers from Tiny Prints! Make spirits bright all season long. All of our Christmas paper goods came from Tiny Prints! Their round stickers look perfect on top of the cocoa/marshmallow jars! These also look great on holiday envelopes and packages. As you can see, I'm all about the hand lettered look this year, and it all came together so beautifully. My family and I are are nestled home in the balmy 60 degree weather of Northern Indiana! It's pretty unreal, but it's not stopping us from enjoying hot cocoa and marshmallows. And it's certainly not going to keep our Christmas spirits down. We're making the white Christmas this year. Cheers and laughter to you and your family this holiday season! Thanks for reading and supporting Pars Caeli, and all of our new adventures!! Beautiful paper Advent calendar for the season - grab the free printable! Counting down the days until Christmas is just about as much fun as actually celebrating the holiday, right? We have chocolate treat calendars for the kids, and this year I wanted to make something for us adults. Selecting from the readings in the Advent scriptures, I took out a passage for each day to take us all the way up to Christmas. And at the close of the season (or everyday, if you'd like), there's a beautiful prayer, expressing the real meaning of the season. Take yourself through Advent with this beautiful printable calendar! Each day is a four inch square design, and the entire printable covers seven sheets of paper. Trim along the edges, and glue to a six inch square of colored paper. This would be beautiful as an all white calendar as well, but we opted for brightly saturated cardstock to accompany the colors in our studio. Pick what best suits your Advent mood! You'll need 6-inch squares to complete the whole calendar. When folding the larger square's corners, be sure to use a nice sharp edge to make your fold and crease it firmly. This will allow for the squares to have an open and shut quality. Are you ready to get started? Purchase a 2017 Advent calendar and download! Love this printable Advent calendar from Pars Caeli! Holidays traditions that add more meaning and more fun into this year's celebrations. Build and fill this charming paper village from The Land of Nod as you countdown to Christmas. I'm a big fan of traditions. For me, they provide something to look forward to and a memory that gets richer with layers. Right now is prime time for me to hog wild (maybe just a little over the top!) and inject the giving spirit into our home. When you think about it, there's just a little over a month of time between Thanksgiving and the ball dropping on New Year's Eve. So we have a lot of fun to pack into a short timespan. But also, I have no interest in exhausting me or my family so we pick and choose how to squeeze the best moments from our time together. Here are our current favorite holiday traditions - and I'm always looking to add more! Whether your tree is real or fake, prepping it and decking it out in all of its finery is a fabulous family tradition. We pack up the entire family, drive an hour in the minivan to arrive at a tree nursery we've really grown to love. They have a great selection of varieties, and we all vote on which tree we want. Then, grabbing a saw from the tool shed, we wander through beautiful rows of tress and decide on the perfect match for our home. We each take turns sawing the tree trunk - it's amazing what a challenge that is!! While the tree is bundled and wrapped, we enjoy a cup of hot cocoa and the rich smell of pine. Holiday traditions to start with your family!! With a few reserved for parents and extended family. All of our Thanksgiving guests have a little homework to do before they arrive for the party. They receive an email with a printable page of stars upon which they write one person/experience/item for which they are thankful. Each person comes with 3-4 (as well as their names and year on the back) and while the meal prep is going on, we attach ribbons to the paper stars and read one another's as we place these first ornaments on the Christmas tree. Only the white lights and white gratitude stars fill the tree for the first week of Christmas to remind us what really matters in the season. In a black, leather bound binder, I keep the stars through the years, and I love looking through them and remembering the guests and gifts of years past and seeing how many remain throughout the seasons. Do you know the tradition of leaving your shoes out for St. Nicholas to fill? On the evening of Dec. 5, all five of us put out a pair of our shoes by the fire. Why? As the legend of St. Nicholas is told, on his feast day (Dec. 6), he visits all the children of the world, for whom he had great affection, and leaves them surprises in their shoes! I've heard of gold chocolate coins and silly socks being some of the most popular presents in his sack. Advent calendars, Christmas tree chopping, and date night shopping. Pin it!! All kinds of holiday traditions. The great waiting until Christmas dat is all part of the fun! We use Advent calendars to build up the drama and to prepare our hearts. We have chocolate calendars to eat our way through the season as well as a calendar with jokes for each day! The printable village box calendar featured above from The Land of Nod is our latest, and it's just the right size for a small and special treats each day. Do you have a park with a special light display or a neighborhood that has channeled the spirit of Clark Griswold? Make an event of it. We have a few neighborhoods that join together to put on a light show worth driving through. We stop off for hot cocoa and cookies at a local restaurant, and we dedicate an hour of one evening to pumping up the volume onChristmas carols and driving slowly through the streets. We began when our oldest daughter was in the backward facing baby seat, and we now have all three children ooohing and ahhing from their big kid chairs (sob, sob). What flicks make your list? What a better time of year to be cozy inside watching the great Christmas movies? Around here, it's bitter cold and always snowy so we warm up the fireplace and snuggle under the covers for our list of must sees. For us that includes, Rudolph the Red-Nosed Reindeer, Elf, Polar Express, and the original How the Grinch Stole Christmas. And once the kids have gone to bed, my husband and I break out It's a Wonderful Life, and I still cry every time George Bailey returns back to Bedford Falls. We are a house of many Nativity sets, our largest is near life-size! Next to that set we keep a carved, heart-shaped bowl, filled with red and green string for our children to use to make a cozy manger. When family members are helpful and especially kind to one another, we put a string in Jesus's manger to keep him warm and soften his rest. We began this tradition when the children were toddlers and have kept it up. Sweet and simple. Nativity sets can have all kinds of character. Use the Advent season and your manger to prepare your family for Christ's birth. I saved my favorite for last!! Here's a secret tradition of mine. I put off Christmas shopping until the last minute - intentionally! Three years ago, Christmas snuck up on us. I know, it's the same time every year, but we were so immersed in the daily stuff that planning for something even two weeks away seemed luxurious and frankly, impractical. My husband and I had our social and professional calendars booked. When were we going to have time to shop for Christmas? In exhausted exasperation, we added a date for shopping after his office Christmas party. On the evening of the office party, we donned our holiday duds (and even smelled good!) and we whisked off together, wonderful babysitter safely watching over the den for the duration. At the cocktail reception, we mingled with couple after couple, making conversation about one another's holiday plans. "Are you ready for Christmas?" we were asked over and over. Funny enough, whether we were caught by surprise or not, it was coming - Christmas was coming. In the din of jovial conversations, I remembered the wonder of the season. I was struck by the silly and temporal nature of my worries as I explained over and over that we were behind on our preparations. You know how sometimes hearing yourself say something makes you realize just how ridiculous you are? That we hadn't (gasp!) shopped for Christmas. And although I was stressed by all that I had to do, I felt a glimmer of hope that no matter what was still left in boxes or unchecked off the list, Christmas was still coming. Christ's birth would still be celebrated - and in full force at our house. I watched my husband explain to his colleagues, in good humor, how we were going out AFTER the party to begin our Christmas shopping. We left the party, laughing together. At 9pm, we were the best dressed shoppers. With barely a soul around, you could hear our heels and dress shoes, as we meandered the aisles - he pushing the cart and me with my arm wrapped through his - strolling and talking about our life together, our children, and the joy of the season. It was that moment right before you turn over the snow globe, when everything stands still just for a little while. We slowed down the world and remembered the family we have built and the love that we share. All the gifts were purchased. Checklists completed. And Christmas did in fact come. What makes your holidays season magical? Add your traditions in the comments section!! This post is sponsored by Sprout by HP. The project and ideas are all mine. Thank you for your support of the brands that support Pars Caeli. Shrink a classic toy down to its miniature for a new game of Tic-Tac-Toe. We love to make things around here, and when I can get my children involved in the making, the joy multiplies quickly. From looming to sculpture, watercolors to oil pastels, our creations fill the walls and shelves of our home. And now our creations even fill our game cabinet. Or, at least, a teeny tiny portion of it. Using our Sprout, we decided to transform my "vintage" Little People figure into a micro version of its former self. What is it about making things small that triples their adorable factor? Since the Sprout has an integrated desktop 3D scanner, it was easy to experiment with our sizing for the game. We want as tiny as their hands could hold comfortably. Using a small piece of putty to hold the toy to the tabletop scanner, the kids and I scanned the figure from all angles. Watch our quick movie below to see the creation is progress (my 6-year old was blown away by the scanning/pattern process - ah, so was I). Printing the 2.5" figure as a 1/2" copy took approximately four minutes from pressing print. This was my first experience with 3D printing and gazing at the layering process of each tiny figure was mesmerizing!! As you can see below, the object is created layer upon layer to produce a finished "fine wire" texture. My children likened it to the grain of wood. Have you tried 3D scanning? The results will surprise you. We printed ten tiny people in an hour! To get these ready for a fierce, yet small game of tic-tac-toe, I painted them two different colors. Using Sharpie paint markers, coloring the figures was fast and easy. Using a small piece of birch, I scraped the hashtag gameboard in the wood, and we're off on our first game. These miniatures make a fun, new take on the traditional tic-tac-toe game. Put them in a tiny giftbox, and you're set for any restaurant wait. The teeny tiny tic-tac-toe game adds its own level of new challenges! If you knock over your own player or someone else's you lose your turn. So the obvious moves and strategy you typically employ for the game are now turned on their head!! After this experience of taking something right from our life and making it into something new and different, I can't believe how close we are to printing and to creating our own worlds! What would you create with a Sprout? See more creations using the Sprout or find a retailer to buy one near you. Frames worth making! These four ideas are easy with great final results. Between the prints in Shop Pars Caeli, my favorite family and Instagram photos, and my children's prolific artistic creations, I feel like I cannot own enough frames! Gallery walls in every room, anyone? Easels and photo blocks are my go-to for shelves and tables, but I need some solutions for wall spaces, too. I turned to some of my favorite makers to see how to get it done with style, simplicity, and affordability. Easels and blocks are great for shelves. For the walls? 4 fabulous DIY solutions. If you have not run with wild abandon onto the washi tape train, now is the time, friends!! Maiko created these whimsical frames and geometrics to highlight her fabulous prints. These serve the aesthetic as well as easing any concern over new wall holes or a permanency you might not be ready for. Have a dingy frame hanging around that needs new life? I love the dipped look just for this reason! Paint half or a diagonal in a fresh color, like white, and it's like a brand new piece. Check out how Nalle created hers. Gold leaf all the things. Even the clipboards! Did you see this DIY on Lovely Indeed? Clipboards are a modern take on the contained frame. These gold ones work especially well in a studio or office space but could brighten even the most buttoned-up living rooms. Gorgeous free printable and frame DIY from Oleander + Palm. This idea is on my must-try list! I love the simplicity and functionality of a great hanging poster frame. Jeran of Oleander and Palm created an amazing alphabet printable as well as a fantastic frame that blends so well with the whole concept. I could see larger prints looking incredible in this style! Even jumbo children's work could reach a new level of sophistication with this DIY. Have you created any of these styles? Have tips to share? How do you display all that you want to see? Add a touch of fall color to your front porch with this pumpkin wreath! Pumpkins are the iconic image of Halloween for me, and I can't get enough of them right now! We made some jack o'lanterns from foam balls and orange yarn last week, and, as projects some time go, we got hooked in the process. The half sphere makes an easy, mountable pumpkin for any craft. These pumpkin magnets make me smile every time I pass by them. Have you ever kept going with a process even after a project is complete because the process itself brings joy? My friend, Emily Jeffords, talks about the enjoyment of the process in her work as a painter and entrepreneur, and it resonates with me. On a more basic level, in this process of crafting, I found the rhythm of slicing the foam balls, the meditative nature of wrapping the yarn, and the assembling of mounds of bright-colored pumpkins totally satisfying. So, I kept going. And made dozens and dozens of yarn pumpkins. Now we have a vibrant pumpkin wreath to add to our front door. With the half spheres, wrap yarn around and around like you're creating a ball of yarn. Make sure that you cover all of the white foam as you wrap. Glue the end of the yarn on the back of the pumpkin. Once you have a few dozen ready, you can get to wreath making. The amount of pumpkins you need depends on the size of your wreath, as well as the size of the foam balls. I had 3" and 4" sized to help cover a 10" wreath. TIP: Cover the white surface of the wreath with orange paper so that the gaps between pumpkins aren't so apparent at first glance. As you add each pumpkin, you'll see the wreath come to life! My son's favorite color is orange, and he is a big fan of the project. I love the impact that the color statement makes with simple forms. You could add faces to each pumpkin or a select few if you want more of a specifically-Halloween feel. As you glue on each pumpkin, be sure to vary the shades of orange so that you end up with a cheerful mixing of the tones. I'm a big fan of how ours pops right off the slate green door! Happy fall!! Remember this project I did with tiny balls of yarn? It's a quick alternative to the larger wreath, with the same process! *This post is sponsored by Minted. All opinions expressed are my own. Thank you for showing love to the brands that support Pars Caeli! We're a few weeks into school now. Can you believe it? My 5th, 3rd, and Kindergartener are humming along with their daily schedules and evening activities. And in order for me not to completely use my mind, we have our systems in place. I still find that I lose my phone or forget someone's library book way more than my wishful, maximizing self would like it. How can we make our days smoother? Less forgetful? Happier? I'm always analyzing and wondering if we could set up our home or our schedule differently to make our days better. So many organizational systems and DIYs are out there (SO, so many, dear Pinterest). However, most of them are not the kind that I want to put in my home. Organization doesn't have to be ugly! Take those cute Minted labels (see above photo) that are saving me many trips to the Lost & Found box. An organized school year is a happy one! Of course, no one wants to skimp on style for the sake of tidy. Here's how to add stylish back to school organization to your home. Inspired by the combo of style and organization, I'm putting these fabulous projects on my fall to do list. They not only make lives more efficient but make (or keep) your home super styling, too. Win!! I swoon over this one! We have a chalkboard wall in our kitchen, and I feel like this magnetic board would be the Gandalf version. Michelle of 4Men1Lady has created this command center that's chic, textural, and completely multipurpose. Clipboards as frames or easels? Bring it on. Why couldn't schedules, calendars, classroom projects be displayed so beautifully? Amy of Delineate Your Dwelling created this piece to hang clipboards, and it's brilliant and sweet on the eyes. The papers that need to be kept for reference throughout the school year? Where should those go? We put ours in a folder holder, mounted right next to our exit door (by the garage) and are easy for people of every height. :) I think the way Summer of Simple Stylings beautified hers is perfect. Who wouldn't want to add to this lovely? The passwords, phone numbers, permission slips, special tickets - they also need a home and often one where they can be seen! Laurel of A Bubbly Life has this chic geometric board idea that I think would fit right in. This project from Lindsay of Shrimp Salad Circus is perfect for the grown ups. Keep your supplies in check, too!! And make the morning rush a breezy, chic moment. Why not keep all your coffee/tea supplies on a gorgeous tray? It's enough to make you feel special and cared for even in the early AM. What's your favorite way to incorporate organization into your home design? Make your own game with this free puzzle pattern of the United States! Use foam to create a game you can use and re-use. This post is sponsored by Cricut, but the opinions and ideas are all my own. Thank you for supporting the brands who support Pars Caeli! Some of my best parties have been the ones where I've planned games for every generation to enjoy! And this fourth of July I'm continuing the success with this fun puzzle activity for guests to take on together. Create your own map of the U.S.! Use Cricut foam and this free pattern. We decided to make ours from foam to give it the weight of a real puzzle, and we added in our patriotic colors to add to the fun. SVG file of the US Map puzzle - I made a free version that you can download! Upload the US Map puzzle file to the Cricut Design Space as a vector file. This will create multiple pages of boards with states on them. If you'd like to use less foam (or less colors), you can ungroup the image and consolidate your states onto less sheets. Replace the normal cutting blade with the deep cut blade. This is super simple: open the latch, release the blade cartridge, press down on the top button to release blade, and insert the new blade. Place the foam on the heavy grip matte. When you select your material on your Cricut Explore, be sure to set the dial to custom, and then on the app, select foam. Also, did you know that the Cricut Explore has a new app for your Iphone? Yup, you can design from anywhere. Once you've cut all of the pieces from the foam, carefully remove the states from each piece. The Cricut Explore can cut even the smallest states so be careful as you remove them from the larger piece to make sure you capture all the details! Get the whole crowd involved in this fun foam map puzzle that you can create! Bring the family together as you build our nation. Pinning this for 4th of July parties! Until Friday, July 3, 2015 , submit through the online Facebook form your answer to this question: Where will you create and/or use the Cricut Design Space™ app for iPhone® this summer? Complete entry details will be available by 9:00 AM MDT June 29, 2015, on the Official Cricut Facebook page. Entrants’ answers must be submitted through the form on the Official Cricut Facebook to be considered, and meet criteria listed in Selection of First Prizes section below. *If you will submit a supplement photo through Instagram, you must follow @OfficialCricut on Instagram, use tags of @ OfficialCricut and #CricutSummer and provide your Instagram handle in your entry form on the Facebook page so that Sponsor can match the photo to the entry. A photo is not required to enter or win. This post is sponsored by AllModern. Thanks for supporting the companies that support Pars Caeli! Make a pillow even cuter with an iron-on message! This quick, easy process is a fun way to personalize. Remember the fabulous 5 Ways to DIY? It's back, and even more awesome than ever. We have taken on pillows with some really wonderful results, and we want to inspire you to try them for yourself with a $250 giveaway from AllModern. How awesome is that?! The team this challenge includes the fabulous ladies behind Delineate Your Dwelling, Sarah Hearts, Oleander and Palm, and A Bubbly Life. We all ordered a solid colored pillow from AllModern. There were so many color options, and this pillow also has a really well made hidden zipper and removable cover. What would you do with a beautiful, blank pillow canvas? This pillow design is a handwritten note. Using my Wacom tablet, I designed the words in Illustrator. Once I had the letters looking as I wanted them to, I created a mirror image of the text for the iron-on sheeting. I used my Cricut Explore to cut the letters out of the sparkly gold iron-on. You can also cut them out by hand, keeping in mind that they should be a mirror image to work correctly for this project. Arrange the words on the pillow cover (removing the pillow insert) to make sure you have everything where you'd like them. Using the iron-on material, you simply use a hot iron (steam off) right on the letters for 15-20 sections to make sure that the image is secure! I wanted to add some sweet words to mine! Don't gag from the gushy mushy sentiment, but in our early years of marriage, my husband would often sing the country song Good Morning, Beautiful to me. I know. He is charmingly overdone, as I like to say. If you're not into sewing, why not try ironing on a fun message? Check out the DIY on Pars Caeli. I love how the sweet message turned out, and our new pillow adds pizzazz to our master bedroom. Want to give it a try?! Enter our giveaway below. You have a great chance to win $250 to shop at AllModern! All you have to do is tell us in comments what project we should do next for #5WaystoDIY. And follow the Rafflecopter for additional entries (I'd love to see you over on Instagram!!). Contest ends on June 29 and is open to U.S. and Canadian residents. Get in on the goodness!! And thanks for following along. The grand reveal of a resist technique make them a lot of fun for kid creations. Try this process to create a letter banner from washi tape and watercolors. 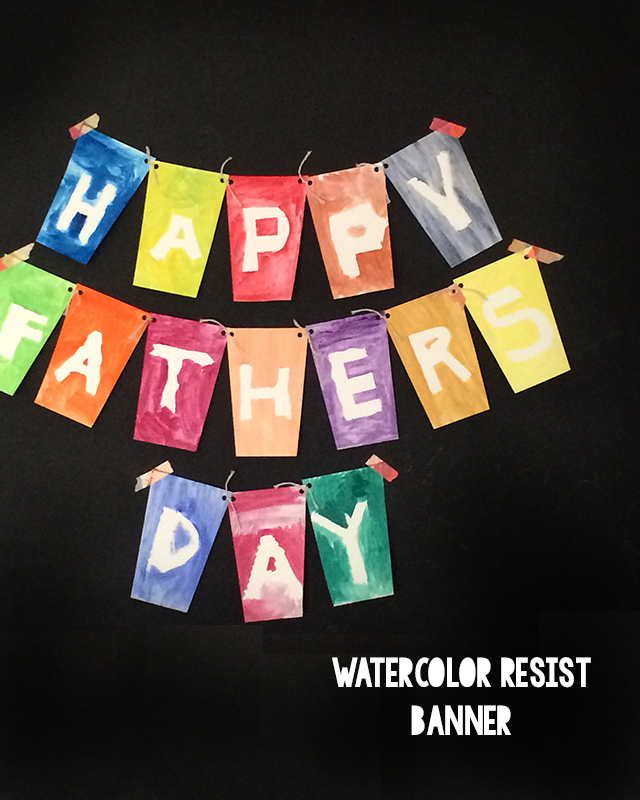 We've been out enjoying the weather as much as we can this week, but we've had a lot of rain mixed with warm temperatures so we had some great time indoors working on summer reading and this fun watercolor resist banner for Father's Day. I'd seen some of the incredible posts that Jean from The Artful Parent has created with resists. We decided to give it a try, making our own letters from washi tape and then applying them to watercolor paper. Any image or shape can be used. We decided to make our own letterforms to spell out Happy Father's Day. Using parchment paper as backing, we created the letters with tape. Once they were the shape we wanted (good practice for my 5-year old as he solidifies his formation of letters), we trimmed and embellished the edges to add some flair. Next we stuck each letter to its own piece of watercolor paper. The children decided that they wanted each letter to be one color, and we practiced using the watercolor paints. It was a tough adjustment for some since our usual painting process involves putting a blob of paint on and smoothing it around. Watercolor is much more fluid, and the brushstrokes can be a lovely part of the finished product. We're still working on our technique. In the meantime, we created a colorful banner, which was a lot of fun to peel and reveal. I holepunched the top corners of each letter, trimmed them into a slightly more angular shape, and tied them together for celebrating. The kids were pretty proud to see their teamwork adding joy and color to our space, and they're ready to paint some more. Have you tried watercolor resist before? With your children? P.S. If you're following along with the 18 Summers Challenge, we're making classic balloon rockets tomorrow. Join us! Make this fun learning game from rocks! Help your children learn how to tell time, figure out how much time has elapsed, and discover the world of timezones. Perfect summer project. We're learning the fun way this summer! And what could be better (or easier) than rocks and some paint? I'm so excited to share with you our favorite new learning activity for preschoolers/K, early elementary, and even middle schoolers. Sometimes my children stare at an analog clock, trying to read it quickly. It feels a bit like a foreign language since our electronics and nearly every clock in our home is digital. We created this game to help them be able to take on time with confidence and to have some fun with it in the process. To make a Rock the Clock game, you'll need a square canvas, 24 rocks (12 larger, 12 smaller), rainbow paints, a white paint marker, and craft glue/hot glue. As the backing, I used a canvas I found on clearance at a craft store. Its image is not one that I wanted to hang, but I knew the canvas frame would come in handy. Using the frame like a tray, I painted the edges black to contrast with the rainbow rocks. Sorting the rocks into two main piles, large and small, I selected one from each pile to paint a shade of the rainbow. Remember that the large rocks will be numbered with hours and the small rocks will have the minute numbers on them. I recommend two layers of paint on your rocks to make sure that the colors are nice and saturated. Once the rocks are painted and dried, add numbers with the paint marker. Let that dry and then glue the rocks onto the canvas. In the center, you can paint or place a simple circle or press a blob of playdough to hold the hands of the clock. We made our hands from two twigs and painted them in different stripe patterns so that it's easy to talk about the big hand (that's black and white) or the small hand (that's orange and blue). For L, our emergent reader, we used the elementary version of Rock the Clock. A stack of cards, with times of o'clock and thirty are an easy way to begin. I sat next to him as he showed me on the clock what the time on the card said. I was amazed how quickly he wanted to move into the quarter hour times because, with the visual of the rocks and the numbers, he understood how the big hand works. Learning is amazing to watch. For C, our new 3rd grader, we made a new set of cards. Her times are set to the 5-minute increment. She wanted to be a bit more independent so I offered her the option of taking a photo of the clock and the card next to each other and sending it to me! This is a great idea for working parents!! Ask your child to set the clock to the time they woke up and text it to you. Also, to challenge her further, the second set of cards asks her to calculate how much time has elapsed from a start time to an end time. She can use the rock clock to count through the minutes and hours and write down her time. And for M, who wants to travel the world, I adapted this as a learning tool for world time zones. Using the printable map, she can discover new countries and relate to how life might be the same or completely different there. I have a lot to learn on this one, too, so I'm excited to learn side-by-side. We think we may turn the game into a working clock at summer's end since we can't resist a good rainbow craft, but who knows. Simple tools like this are amazingly helpful to boost learning and take understanding to a whole new level. Know anyone who might enjoy creating and playing with Rock the Clock? Send this post along! Good Monday morning! I'm delighted share a special project with you that is featured in the second issue of a fabulous online magazine called Merry, created by my friend Melissa of The Sweet Escape. Slices of citrus add the color and the vibrancy to summer's blooms! The toughest part of this centerpiece is finding just the right vases. You're looking for two that fit nicely inside of each other, with a quarter to a half an inch gap where you can add in the fruits. Oranges, grapefruit, limes, and lemons will last for a few days with no maintenance. Some of summer's best treats come in the warm temperatures, the sun-kissed colors, and the gorgeous florals. Using two glass vases of similar shapes, you can create a lovely combination of all the bests of the season. With a mixture of grapefruit, orange, and lemon slices, the walls of the centerpiece become a showcase of citrus. Pair these circular slices with voluminous peonies for a blend of beauty and a delight for all the senses. Pairing similar tones makes for a sweet bouquet of freshness. Consider also a sharp contrast with an aloe plant or tropical variety for the inner vase! Merry Mag is a beautiful online magazine showing you the best projects for the sweet summer hours. Browse through the 98 pages of goodness at Merry Mag. Congrats to Melissa and to all twenty contributors on a lovely summer resource. Head on over to Merry Mag to see ninety-eight pages of photos and projects to make you swoon! P.S. If you're joining us for the 18 Summers Challenge, we're making music tomorrow with water and glasses. Break out the food coloring! Take a great recipe to the next level! Plant a pot full of the ingredients and add the ingredient list, handwritten on the pot. A fabulous teacher present, too! Summer is the best time to be outside! We love getting to know local plants and flowers and planting our family garden is a highlight of the summer's start. Frequent visits to the nursery for vegetable and herb plants are just a part of our summer ritual. The kids love to touch and to smell each plant, and I love that they are more interested in the meals and dishes we create with the plants that they have grown (bonus!)! As a fun extension of our usual veggie patch, we decided to make a special garden for one of their new favorite foods - salsa! Tacos, burritos, and guacamole have been added to our menu planning, and the kids expressed interest in making our own version. Add your favorite recipe with a paint marker and plant a garden just for this dish! Makes a wonderful hostess gift or teacher present. With so many great salsa recipes out there, you likely already have your own blend, but if not, try this one from Lulu the Baker or Cooking Classy's restaurant style. We know that not every ingredient is readily available locally so we put together what we could find. The supplies are simple on this one: one large terra cot pot, outdoor paint (one that seals the pot for you), a white paint marker, and your plants. Perhaps your garden will be an Italian selection for pesto or a French selection of tarragon. Pick your recipe and then select your plants, keeping in mind that some might need to be transferred as they grow larger. In our salsa pot, we have roma tomatoes, two cilantro plants, and a few yellow onions. It smells so delish! And it's already brought so much happiness before we even get to the final product. Seeing my children enjoying the gifts of nature is a fabulous part of our 18 Summers Challenge. And M loved making one as a year-end present for her teacher, too! Give a mini garden of all the best ingredients for a wonderful salsa and write the recipe right on the pot! Great teacher gift!! P.S. Are you joining in the projects we're creating for this summer together? Up tomorrow, a fun game called Rock the Clock. Get those stones ready. P.P.S. If you want a sneak peek into all that's ahead, including supply lists, subscribe to the Pars Caeli newsletter by adding your email below. It's strawberry season! And picking time is our favorite. Today we're enjoying the sweet flavors of strawberries with a fun take on a traditional strawberry shortcake that leans a bit more to the messy and child-loving side. Strawberry Shortcake Stars are a treat perfect for July 4th or any star-studded celebration, like the end of great day! The kids and I love to bake together so we'll be sharing more recipes like this during the 18 Summers Challenge, and we all love strawberries so this was a win win for us. Not every day is a great baking day, though, (remember those ideas I gave for having success with your kids in the kitchen?) so I waited until L and I had some time to ourselves to create treats for the rest of the family. Give yourself about an hour from start to finish for this recipe and enjoy the mess of flour and dough. It will happen. And the messy will likely be your child's favorite part so do your best to set aside the need to keep tidy. Take a plateful (or about 4 cups) of sliced strawberries to make a family portion of Strawberry Shortcake Stars. Mix these two together and set aside while you're making the rest of the recipe. Mix these strawberries and 2 tablespoons of sugar together and set aside while you're making the rest of the recipe. Stir together the sliced strawberries with the sugar (a great job for little hands). Set aside. Be sure to take in the delicious smells of fresh berries. Mixing and kneading are great skills for children to accomplish. Make these yummy Strawberry Shortcake Stars with your kids! Whisk flour, baking powder, and salt together in a large bowl. Add the heavy cream. Form the dough into a ball within the bowl and then move to a lightly floured surface for kneading. Not much is necessary, only one or two pounds to be sure you don't have tough cakes. Roll the dough to about 1/2-inch thick. With a star cookie cutter (we used one 3" wide), cut out shapes and transfer them to the baking sheet. We were able to make 10 stars from our batch. Gently pour less than a teaspoon of heavy cream on each and sprinkle with sugar. Bake for 15 to 17 minutes or until they're golden brown. Cookie cutters are handy all year round! Strawberry Shortcake Stars. Let those cool while you put together the cream. Make sure the ingredients here are very cold. We had ours a little warmer and the cream was extra melty but still delicious! Mix the heavy cream, sour cream, sugar, and vanilla extract with a mixer on high speed. Continue until peaks form. Creating your shortcake is as wonderful as sandwich making. Slice the stars horizontally to create a top and bottom piece. First add a layer of cream, and then 2-3 spoonfuls of strawberries. The amount of cream and strawberries you add makes it more or less a sandwich treat. Some enjoy shortcake with a fork anyway. This easy recipe for strawberry shortcake is one that you can do with the kids! Find more info on Pars Caeli. Little fingers won't be able to stay away from these delicious strawberry shortcake stars, the simple, delicious way to use in-season berries. We loved eating these as open face treats, too. This allowed for extra dollops of cream and more heaping helpings of strawberries! Have you made any strawberry treats this season? P.S. For those following along with the 18 Summers Challenge, we'll be going on a hunt in nature tomorrow! Printables, printables, printables!! Looking for an easy gift to whip up? One of our favorites is the DIY Dry Erase board that can add some personality to your message keeping. Looking for an easy, quick gift? Turn any large frame into a patterned dry erase board. Simple how-to on Pars Caeli! The color (?) white has grown on me in recent years. But I will admit, I'm a true color lover so the idea of making a white board not so . . . white is right up my alley. All you need is a larger frame (for a better writing surface), fabric, scissors, and sturdy tape. Pick fabric you love, but remember to keep it light enough that your writing will still show, and subdued enough in pattern that the fabric doesn't distract from the messaging. All you need: fabric (preferably one lighter in color with subtle patterning), scissors, large wall frame, and tape. Simply wrap the frame backing as you would a present, maintaining a tight pull on the fabric as you secure it with tape. The corners are the trickiest so trim as you need to be sure to get a flat finished edge. My two daughters share a room so we created two of these blue marbled boards to unify their spaces. And I love that the boards are lovely pieces of art when not used for the latest homework tracking or doodling. Fabric can be easily removed when you're ready for a new pattern, too! Way easier than repainting a room, wouldn't you say? What do you prefer a white board? Or a dry erase board with personality? This post is sponsored by Sprout by HP, but the project and thoughts are all mine. Thank you for your support of the brands that support Pars Caeli. Mother's Day is just a few days away, friends! Are you ready to celebrate the mommas in your life? I've been looking at cards for the passionate mothers I know. And I have to admit that what I found fell a little flat. The racks were filled with more pastels and nostalgia than what fit these go-getter moms that I want to honor. So I decided it was time to make my own. You know I love printables! After a quick trip to the store, I was inspired to incorporate the beautiful tones and textures of the citrus, vegetables, and blooms. I mean, peonies!! Typically I'd need to illustrate these props or photograph them, but with the new Sprout by HP I have greater possibilities. The Sprout is a touchscreen PC with a built-in overhead scanner, and it gives you the freedom to capture both 2D and 3D objects. I can scan anything, flat or dimensional, in a matter of seconds and quickly incorporate it into any design that I've created. I'm a big fan of the touch mat/touch screen combination because they work together so seamlessly and allow an even bigger canvas or the functionality of two work surfaces. For the Mother's Day card, I wanted to use limes, lemons, artichokes, peonies, nectarines, and kiwis - the most vibrant textures and colors I could find. Putting wax paper on top of the touch mat, I created images of each of the props. With the touch mat, I could resize, edit, and move around each shape to create just the look I wanted for my design. I love it when work feels like play and the hands-on quality to the Sprout makes everything feel like childhood fun again. Mother's Day card made modern. For the passionate, go getter mom in your life! A free printable card from Pars Caeli. I found this wonderful writing from Oliver Wendell Holmes, Sr., that seemed to fit perfectly. Have you read it before? A mother's love outlives them all. Get your free Mother's Day printable card here. It's sized to 5 by 7 inches so that you have plenty of room on the interior to say all that you need to say. So pop in a nice piece of white cardstock and get to writing! Or, if you're looking for something to give? Why not trim this one to the cover alone and frame it? I'm so glad that I was able to see my mother and mother-in-law this past weekend and celebrate together. Mothers are such an important part of our lives, and I'm grateful to have such examples to follow! What would you create with a Sprout? A sweet, homemade gift for mothers and teachers! 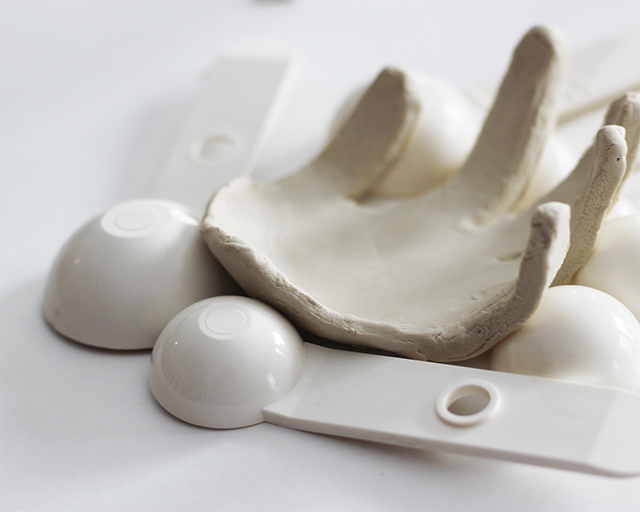 Make this one with your child from air dry clay. Children's handprints are such a lovely way to capture the littleness of childhood. As a mom, I save all of the construction paper tracing and funny animal crafts that come home using my children's hands. I just love them! When my friend Jeran, posted these fabulous photo holders made from air dry clay, I immediately thought of my children's handprints! I wanted to create with these small shapes in such an easy medium. And then the usability of a small dish evolved as we were playing with the flexibility of air dry clay. I purchased Crayola's tub of clay to give it a roll. First we took about a baseball-sized ball of clay. It's softer than potter's clay and easy to manipulate. Using a rolling pin, we flattened the clay and traced out L's hand with a pencil on the clay. He removed his hand, and I carefully pulled away the excess clay. If you're trying this, make sure that you have clay rolled out to about 1/4 inch in thickness. Too flat makes the hand plate too flimsy and too think makes the fingers hard to move. Using a spatula, I lifted the palm and fingers to allow them to dry on an armature for shaping. I'm all for working what you have so I grabbed some unused measuring spoons to prop the clay into the bowl-like shape I wanted. Follow the instructions on the container to make sure that it's dried completely before you move it. You'll notice that it turns more bright white as it dries. My children loved seeing their hands as art! And they thoroughly enjoyed making an object they knew their teachers and grandmothers would use on their desks or dressers. Have you worked with air dry clay? You should give it a whirl if you haven't yet! You can use found objects to create fun stamps for any kind of project! Pin this one for later. Stamps are a great addition to every creative toolbox. They can be pricey to accumulate unless you're willing to explore some simple techniques for making your own unique stamps. Add foam circles to an empty tape roll for a fantastic polka dot effect. Foam shapes make a great rubber stamp substitute. They won't last as long as the originals, but they offer a quick solution with super results. We used an empty tape roll and added foam circles of varying sizes for a polka dot pattern. You can carefully roll the tube down the paper or wear it on your arm for a fast tread of dots (a favorite with my crew). Add foam stars to a ball for a fun rolling stamp activity. For the smallest hands, we added some star shapes to a ball that can be rolled around for patterns and stripes. Rolling in ink is all kinds of messy fun! For the more detailed oriented, grab a basic pink eraser or a stamp compound, and trace a design for your stamp. We transferred a simple ladybug image onto the stamp using tracing paper and a pencil. With a carving tool, remove the part of the image that you do not want stamped. The ink will only adhere to the shapes that remain. Press your new stamp into an ink pad and repeat in random or ordered patterns! Enjoy the imperfections that come as you continue the process. We love creating our own stamps! Have you ever tried it? Ever thought of starting your own shop? Read this first - advice from four amazing entrepreneurs. Have you ever thought of selling your creations? Maybe having your own store? I am excited and delighted to try it for myself, and I'm a strong believer that in starting a new journey you need to talk to those who have gone before you. And so I asked four of my favorites over for a virtual coffee. Meet Lacy, founder of Madre Beads, a hot new boutique with non-toxic wooden jewelry for kids and women. And Kim, creator of Design Life Kids, a fast-growing treasure trove of hip and hot fashions for your home, your children, and yourself. Meet Emily, painter and creator of Emily Jeffords Studios, a beautiful escape from the mundane where you can find original paintings, prints, and creative consultations. And finally, Gilit of The Bannerie, maker of glittery, fun-filled messages for all your celebrations. 1. What prompted you to open a shop? I love the wide variety of inspiration in these answers! Where would you find yourself? Sometimes everyone around you sees something about you before you do. In this case I had been told for years that I should sell my stuff and start a business, but how intimidating does that sound? In the months before I started, my daughter was home with me, and the jobs I was looking for needed someone to work nights and weekends. I wasn't willing to do that anymore. I needed a job, I have a strong drive to create, and I've always dreamed of having my own shop. So I did it. As a mom of three, I was continually frustrated with the jewelry options for mothers. Nearly all of the jewelry I had wasn't baby-friendly. Sharp metal certainly didn't belong in in my baby's mouth, and everything else I had hurt my neck when she pulled and yanked at it. I started playing around with some designs and did a bunch of research to find the best baby-friendly beads and finally came up with a concept I loved. Now, I make playful jewelry that moms can wear with the comfort of knowing their babes can enjoy pulling, tugging, sucking and chewing on it, too. I opened my Etsy shop right after my college first art show. I had a nice body of work built up from my college days and needed a place to document, share, and send it off into the world. I wanted to fulfill a dream after the loss of my husband. I wanted to set an example for my girls to make the best of this life we have and not be afraid to go after your dreams no matter how hard they seem and how much work it might entail. Find the hip and the modern over at Design Life Kids. 2. How long has the shop been open? What did you sell initially? My shop has only been opened for less than a month! It's going to be a year! Initially I was ALL over the place with every banner that I ever made and with anything that anyone asked me for even when I didn't want to make it. I always felt it wasn't the right move, but it took time for me to figure out what was the right move, which was to brand and focus. I opened DLK on October 1, 2014. I focused mostly on children's clothing and a few toys but have expanded into a fun collection of modern housewares and decor! Fresh messages in all that glitters are the specialty of The Bannerie. 3. How did you get the word out about your shop? After my first baby was born, I was a stay-at-home mom, loving every moment, but I felt that I needed a challenge. I decided that I would create a painting-a-day and sell the paintings in my Etsy shop! Back then, Etsy was a much smaller place. I also blogged every day, showing my work to my natural market and reaching a few new people. This circle grew and became something small, but very supportive. I began spreading the word about Madre Beads on Instagram. For the first few months, I gave sneak peeks that I hoped would lure customers in. I think the anticipation really got people excited! Find fabulous wooden beads like these at Lacy's new store, Madre Beads. Free social media is a small business owner's best friend! Instagram was my support system and has become my best way to reach customers. Having a consistent aesthetic and being authentic has always been important to me there. 5. What's the best advice you can give to entrepreneurs considering starting a shop? Start small with inventory. It's better to sell out than it is to sit on it. And breathe... being an entrepreneur really requires passion and dedication, but it's really an awesome experience if you can keep it fun. The best advice I was given as a young artist, counting every single penny: Invest in photography. You can do it yourself, and you can totally DIY good styling, but invest time and thought in the execution and money in a good camera. Photography sells online. Give your work the credit it deserves! Plan way in advance and do your absolute best. I have started other small business before, on a whim, with no plan or purpose in site. As you can imagine, those businesses didn't do so hot. With Madre Beads, I took my time. I did research. I learned from my mistakes. I got feedback from friends. I made surveys and asked questions. I worked hard to develop my brand, even before I began making all of my products. I'm always putting myself in the customer's shoes. "If I saw this photo, would I like it?" "Would I buy this?" Would I pin this?" "Would I give this as a gift?" Also, be prepared to work hard. It's not like being your own boss means you get to stop and have coffee whenever you want, it means you are in charge of EVERYTHING. Even if it feels like you don't have a minute to breathe, or you won't be at your best, remember that you have to take care of yourself first and foremost. Thanks so much, Lacy, Emily, Kim, and Gilit!! I loved hearing the origins of some of my favorite shops. What advice would you offer? If you're looking for eggs that are out of the ordinary, I've got five great ideas from talented folks around the web. Do you dye eggs or decorate them at all? Have you dyed Easter eggs yet? We always leave this activity for the end of Holy Week, Friday through Sunday, when we're all together with a little more time together to create. Usually I fall in love with saturated pastels or marbleized wonders for Easter egg creations. I always leave one white egg that I make into a bunny with ears added on. But this year, I've been inspired by all of the creative eggs I've seen! I've rounded up my five favorites (and there are a ton out there, including more on our Easter board). 1. Bunnies and friends: If you still want all the cute in your eggs, check out Confetti Sunshine's adorable post on making these sweet versions of the traditional. I love the minimal expression on them to bring out a modern feel! 2. Fruits & Veggies: Little Inspiration created bright designs that could come fresh from the market. I love the way she transformed these into something else entirely! So fun. 5. Great Art: These are too punny. Jen of Classic Play made four great artists as eggs! And, of course, there are free printables that coordinate. Freida Kahlo as an egg is ah-mazing! Fun, educational, and totally unique. What's your technique this year? I'm always looking for fresh takes on traditions. P.S. If you're looking for a great list of sugar-free goodies to add to Easter baskets, Handmade Mood has a fab round up. P.P.S. Mommy Coddle has the cutest wooden bead bunny necklace that would make a great afternoon project to keep everyone busy for the Easter weekend!